Languages and mother tongue data of 2011 Census released by the Census authorities have revealed that percentages of Assamese, Bodo, Rabha and Mishing language speakers in Assam have declined while percentages of Bengali and Hindi speakers in the State have increased over the decade 2001-2011. An NEZINE report revealed that the percentage of Assamese-speaking people in Assam has further declined to 48.38 in 2011 from 48.80 in 2001. The percentage of Bengali-speaking people has increased to 28.91 in 2011 from 27.54 in 2001 while the number of Bodo speakers declined to 4.53 per cent of the total population in 2011 from 4.86 per cent in 2001. Number of Hindi speakers increased to 6.73 per cent in 2011 as compared to 5.89 in 2001. There has been a considerable decline in the percentage of Assamese-speaking people – in 1991, it was 57.81 per cent in Assam whereas in 2011 it stands at 48.38. The Bengali-speaking people’s percentage in 1991 stood at 21.67 per cent. The report further stated that while decadal percentage of all major language groups registered an increase, the Rabhas recorded a sharp decline of 15.04 per cent over the decade from 1,64,770 persons in 2001 to 1,39,085 in the country and from 1,30,875 to 101,752 in the State. The number of Santali speakers also declined from 2, 42,886 in 2001 to 2, and 13,139 in 2011 in the State. The data show that of the total population 31,205,576 enumerated in Assam during 2011 Census, 15,095,797 are Assamese speakers, 9,024,324 are Bengali speakers, 14,16,125 are Bodo speakers, and 21,01,435 are Hindi speakers. Corresponding figures in 2001 Census were: Assamese – 13,010,478, Bengali- 73, 43,338, Bodo- 12, 96,162 and Hindi – 15, 69,662. The increase in absolute number of speakers of these four languages over the decade 2001-2011 in Assam was: Assamese – 20,85,319, Bengali – 16,80,986, Bodo -1,19,963 and Hindi – 5,31,773. 1.26 per cent in 2011. Altogether 1,53,11,351 persons returned Assamese as their mother tongue in the country in 2011 as against 1,31,68,484 in 2001 and 1,30,79,696 in 1991 (1.56 per cent of the country’s total population). 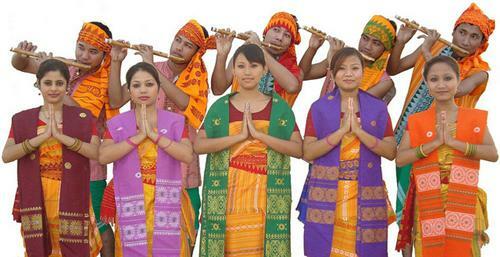 Mishing-speaking community figure stands at 6, 19,197, the Karbi-speaking community figure stands at 5, 11,732, the Dimasa-speaking community figure stands at 1,31,474, while the Rabha-speaking people’s figure stands at 1,01,752, the Tiwas, recorded as Lalung in Census 2011, figure stands at 31,821 and Deoris stand at 27,441.